Edited by: Michael Albrecht, Veit Arlt, Barbara Müller, Jürg Schneider. With contributions by: Elizabeth Edwards, Richard Fardon, Barbara Frey Näf, Christraud Geary, Erin Haney, Anton Holzer, Paul Jenkins, Thoralf Klein, Marisol Palma. This volume contains most of the papers presented at the symposium held in Basel in September 2003 to mark the retirement, after thirty-one years, of Paul Jenkins as archivist of the Basel Mission. 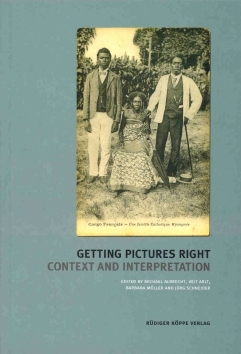 The occasion and this publication particularly addressed Jenkins's pioneering role in preserving and interpreting mission photographs and in promoting them as a unique and valuable resource for the study of the missionary encounter with, and perception of, indigenous cultures and peoples. As John Ruskin observed in the 1860s, photographs are "of great use if you know how to examine them" [...] This is a rich, absorbing, and well-illustrated compilation, [...] and the editors are to be congratulated for bringing it to press so expeditiously. Most of the nine articles in this beautifully illustrated volume were presented in 2003 at a symposium to mark the retirement of Paul Jenkins as archivist of the Basel Mission. Many Africanist historians will, for a variety of reasons, share Patrick Harries's view of Jenkins as an 'archivist from heaven'. [...] Only three articles are explicitly devoted to Africa [but] Africanists can also learn a great deal on methodology from the three articles on other continents. [...] The book is a fitting tribute to Jenkins's pioneering achievement. At the same time it opens up a myriad of perspectives for future research, not least in African history.